Manufacturer of a wide range of products which include mounted offset disc harrow (bush type), mounted offset heavy duty, animal driven plough, tandem hydraulic disc harrow, mounted offset disc harrow bearing type and 8 disc harrow. 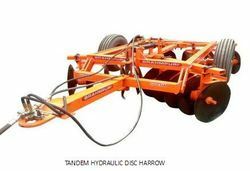 The BRAHMPURI MOUNTED OFFSET DISC HARROW ( BUSH TYPE ) is used in open farm workings for the superficial ploughing, for the shattering of clods, preparation of soil for sowing, burial of organic substances & remains. MS CHANNEL 100X50 AND MS ANGLE OF 65X8 MM. MS SQUARE 32 MM 2 NOS. FRONT 6 AND REAR 6 ( PLAIN OR SCALLOPED AS REQUIRED) OF 550 MM DIA MADE OUT FROM HIGH CARBON STEEL DULY HARDENED AND TEMPERED. BRIDGE STRUT IS EXTENDED UP TO FULL LENGTH OF STRUT BARS MADE OUT FROM MS FLAT 50X10 MM. Backed with great experience, we are reckoned as one of the most reputed manufacturers and exporters of Animal Driven Plough. Ours is a range which can be used in any type of weather because of their corrosion resistance quality. We make use of the best materials available which are processed in controlled temperature to give a quality which is favored by many. Animal Driven Plough ensures less pressure on farm carnal to ease up the entire task. 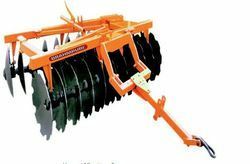 The FARMKING MOUNTED OFFSET DISC HARROW ( Bearing Type) is used in open farm workings for the superficial ploughing, for the shattering of clods, preparation of soil for sowing, burial of organic substances & remains. NEW TAPER ROLLER BEARING 8 NOS. 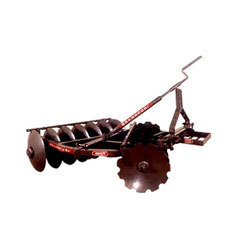 The BRAHMPURI 8 Disc Harrow used in open farm workings for the superficial ploughing, for the shatter of clods, preparation of soil for sowing, burial of organic substances and remains. MS Angle 100 X 8 mm and MS Flat of 100 X 10 mm.